One size as written, but very easily customized to be larger or smaller. 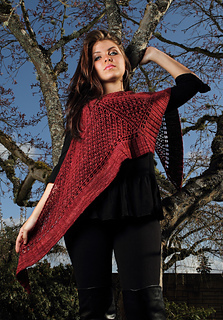 Sacha is the triangular interpretation of the Knit Rhapsody design Charlize. 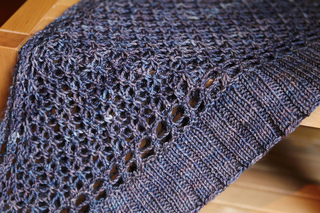 Worked as a classic triangle from the top center and outward to the ruffled edging, the lace portion is intuitive yet simple, with each shawl half being complete mirror images of one another. Its large wingspan drapes beautifully around the neck or shoulders of its wearer & adds a touch of elegance to any outfit. Instructions are provided in both row by row written instruction and chart form. Step by step images of the ssk-sl-pnso-sr stitch available on my blog! Sample shown is approximately 63”/160 cm along top edge and 17”/43 cm deep down the center stitch after blocking. Gauge: 20 sts & 32.5 rows = 4”/10 cm in 3x2 rib, unblocked. 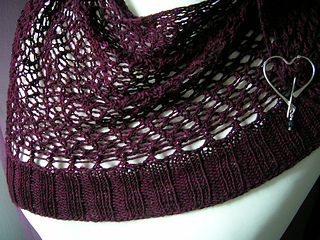 Getting exact gauge is not critical, but it will affect yardage needed for your shawl. 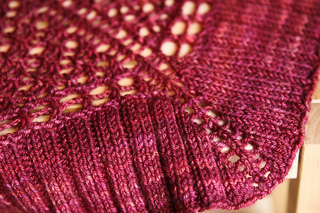 Test knitters who used US 7 (4.5 mm) needles used slightly over 400 yds / 366 m of yarn. Please make sure to have sufficient yardage if an exact replica of the sample is desired and you are planning to use larger needles. Otherwise, the edging can easily be bound off on any RS row as they did. 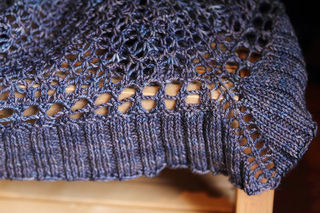 To omit yarn overs in the center of the ruffled edge, substitute the yarn overs around the center stitch with M1R and M1L increases for a solid edging.